Summer is a time for grilling up delicious hamburgers in the backyard with friends and family members. However, if you're looking to instill better eating habits in your little ones, you may be trying to avoid the usual greasy, fatty barbecue choices. 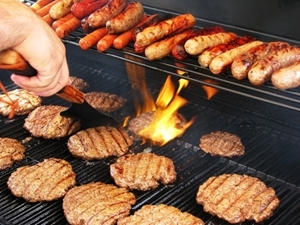 Here are some tasty alternative foods to consider this summer grill season. Red meat isn't exactly the healthiest option on the dinner table, so consider picking up some equally tasty salmon or turkey burgers. Leaner and lighter than your typical hamburger, these alternatives are great for meat lovers who want to eat healthier meals without resorting to veggie burgers – though those can be yummy as well. With all the bad press that traditional hot dogs have gotten in recent years, it's no surprise that many people are looking to eliminate them from the classic backyard barbecue menu. However, you can still enjoy much of the same flavor with chicken sausages, which are a welcome change of pace at the picnic table. Many varieties of chicken sausage also come with unique flavor enhancers like jalapenos or roasted garlic inside. If you want to get away from fatty potato salad, French fries and potato chips as barbecue sides, consider simply grilling up some vegetables instead. With a light sprinkling of seasoning and extra virgin olive oil, your kids will be surprised at how much flavor barbecued peppers, asparagus, zucchini and squash can pack. Similarly, grilling sliced fruit for dessert can be a creative way to top off the night.